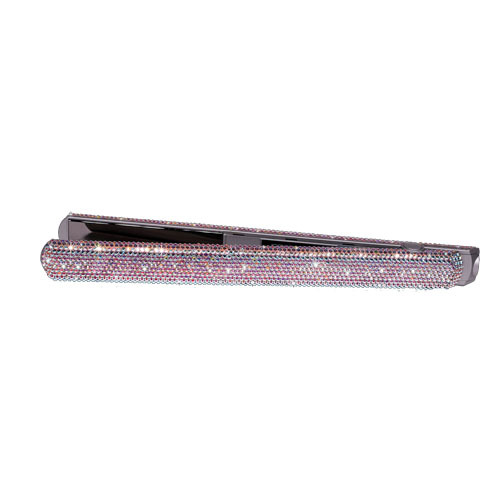 Corioliss C2 Slim Digital Straightener Crystal is the world`s first crystalised styling iron. Expert craftmanship and advanced technology combine seamlessly to create the exclusive C2 Crystal, the world�s first genuine luxury styling iron, made with crystalised Swarovski Elements. Each exclusive C2 Crystal has been customised with no less than 2553 Swarovski elements, each one encrusted by hand resulting in a dazzling and truly unique professional styling iron. The innovative Corioliss C2 leads the way in professional hair styling tools by combining cutting edge technology with sleek and ergonomic design. This sophisticated, sleek hair straightener has won Product Innovation of the Year for its innovative design. The titanium plates amazingly expand when heated to guarantee perfect alignment when styling and allow the C2 to glide through your hair, locking the moisture in and leaving them silky smooth. They also give off negative ion energy, which removes static whilst allowing maximum styling capabilities. These Corioliss straighteners heat up to 210�C in less than 20 seconds and the temperature can easily be regulated by the digital remote that is built in to the cord. Wait until the plates reach the setting temperature. Hold it by the handle to style correctly. Put dry hair between the two plates and press the handle to close the straighteners. Slide it down towards the end of the hair.